The SL Guide to Lacrosse basics is designed to help you overcome many of your questions concerning the particulars of this magnificent game. Lacrosse, also passionately known as lax (same pronunciation,) is addicting in its fast pace and intense action. It is commonly said that those who take the opportunity to pick up a lacrosse stick will never put it down. If you are new to the game this guide to lacrosse basics will help solve some of the mystery of the sport that has such a very rich tradition and long history. I hope you enjoy this 10 page guide. Currently there are 10 pages to the Guide. We have laid them out in order at the bottom of the page for your reading pleasure, but feel free to jump around as you like. Lax is the fastest growing sport in America. The fact that everyone can play, Men, Women, Children, makes it very appealing. 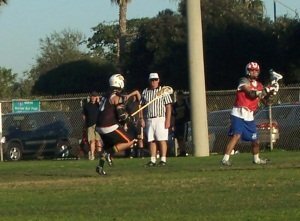 There are also many levels that start with youth lax, and then move into High School, College, Pro, and International. There are also many clubs that have adult leagues as well for the veteran players to be able to continue to play the game and these leagues vary from simple recreational leagues to very competitive traveling leagues. The sports roots are still preserved in many ways as Native American tribes across the country have teams, and the Iroquois nation has its own international team, and competes as a sovereign nation. If you come from a sports background, but are not familiar with Lacrosse, as your read through the pages of our guide to lacrosse you will find that there are similarities to many of our beloved sports. Many people react with comments like, “it is sort of like Soccer, and um err, well it’s sorta like football, and um you kind of play it like basketball, but it looks like Hockey.” These kinds of comparisons are normal, but what you need to realize is that this sport is much older than all of those sports, and from my perspective the truth of the matter is that all of those sports have elements of Lacrosse in them. Lax is fast like hockey. And you score goals much like you do in Hockey. The goals (nets) are positioned in a similar manner as Hockey where you can move behind the goal. 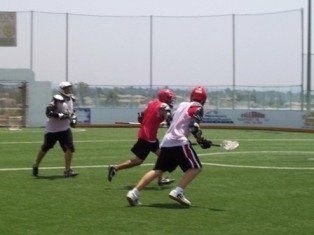 Lax offensively is also similar to hockey, but also has many elements that are present in basketball and even soccer. Fast breaks, Transition offense, zone/man defenses, and moving the ball around, all happen very much like basketball. It resembles Soccer in that it is played on a similar field. And it has similar objectives. you spread your players out similar to soccer. But unlike soccer lacrosse can be extremely physical, and many of the skills used in football translate. In Men's Lacrosse there is lots of contact. In fact in Indian history many people were killed or seriously wounded playing the ancient predecessor to modern lacrosse, and one of its primary purposes was to train men for battle, and to settle disputes among tribes among other very culturally important issues. Womens Lacrosse is much more precise with less contact. The thing that none of the other sports have that makes Lax truly different is the "lacrosse stick" or "crosse". To the Indians the stick was sacred and spiritual. It was said to be an extension of its owner. It was specially selected and carefully crafted often with spiritually relevant figures and designs carved into it. While hockey and baseball use sticks too, the crosse is special because of the net. The skill required to use the stick effectively is considerable. The goal of the game is to score the most points by throwing the ball into the opponents net, but the real beauty of the game is in the difficulty and true skill and practice it takes to master the stick. One player carries the ball with the stick and the opposing players are all trying to knock the ball loose. Which is much easier to do than it is to hang on to it. And to me this is where the real art of the game happens. It is also why athletes of all sizes and shapes can participate in Lacrosse. Those who do not have the perfect body type for our traditional sports can and do excel in this game. As new people continue to be introduced to lacrosse for the first time. I think it is important for me to start this guide from the foundation by making sure that new Stickbrains™ understand where the game came from and what makes it so special. Honoring the history of lacrosse is very important to those who coach, play, and love this game. Many people are surprised when they learn who invented lacrosse. Newcomers often mistakenly believe that it has Canadian or French origins, but there is a tremendous amount of pride and respect for the sports Native American Indian roots. As you fall in love with the modern sport always remember to respect its past and its origins.